How Much Does Telescopic Forklift Training Cost - Be Certified Today! Telescopic forklift is also called as telehandler or teleporter. It functions as a counterbalance forklift but with the appearance of a crane. 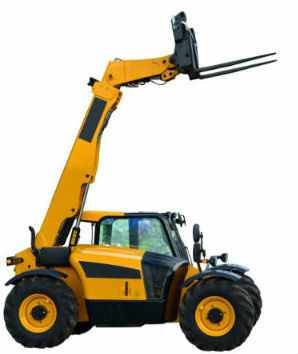 You can commonly found this type of forklift in construction sites and in agricultural areas. Driving this kind of machine requires a license. The law instructs employers to train their workers to ensure their safety but the law does not specify how telescopic forklift training should be done. The telescopic forklift training course may depend on the skill level and experience of the trainee. If you are an experienced operator and a holder of safety certificate issued for the last two years then you can complete a training course in a single day. Otherwise, if you a new operator wanting to be certified on this machine, the training course could last 3-5 days. If you are situated in the United States, we have provided you the list of schools where you can take the training, just select your location, you can FOLLOW this training tutorial how to get certified as per OSHA standard. If you are residing in the United Kingdom, you can select with one of the schools listed below where you can have your training course. You must understand first what kind of training certificate you need. If you are intending to work or working in the construction site, then you need CITB (CPCS) card. On the other hand, if you are working or wanting to work in companies other than construction, ITSSAR training is the most appropriate for you. The telescopic forklift training will have an element of classroom lectures through multimedia and power point presentations and one-on-one discussion with the trainer. A written test will be administered in order to measure the knowledge gained by the trainees. The most important part of the course is practical driving where students carry out sets of tasks the trainer will be given to them. The trainer will make an assessment/evaluation after these three parts have been done. Successful learners will receive a certificate of course completion and operator card. The training cost depends on the experience and requirement of the operator, a novice operator tends to pay more because training is lengthier. If you only require conversion and refresher course, it is, of course, less expensive. The cost also may depend on where you want to take the training, it could be either on-site or at the training school's facility. The training cost varies from £300.00 to £700.00 that may also depend on several factors. You can refer to the training schools listed below, we have gathered the costs of their training packages. The training school is the best place to receive your training. They are equipped with complete facilities and certified trainer. Below are some of the schools that provide telescopic training course. We have indicated their addresses so you can choose which one is nearest to you. You can contact them and enquire about your requirement. J & D Training Ltd. Choose which certificate is suitable for you, it could either be CITB-CPCS (for construction work) or ITSSAR training (non-construction). Cost of training will depend on your skills and experience. For employers, you can arrange training at your site or you can send them to training school. For a novice, take some time to finish your training, it is your path to enter this field.